For this sunny and intimate July wedding at My Moon Restaurant in Williamsburg, Brooklyn, we created loose, garden style arrangements for lovely couple Einat and Jesse. Stylish bride Einat was loving a color palate full of white tones, lavenders, peaches, and silvery greens. Her bridal bouquet included dahlias, fragrant peach-colored garden roses, sprigs of lavender, and luminescent lavender-toned clematis. A few succulents added a touch of personality to the bouquet and the colors were heightened by bright green accents. Centerpieces in sweet bubble bowls lined the tables at My Moon Restaurant in colors that matched Einat’s bridal bouquet. 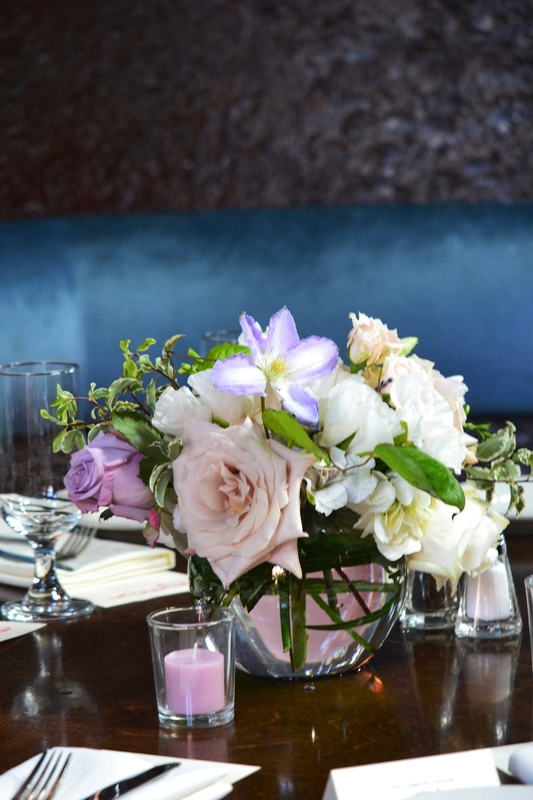 The centerpiece arrangements included hydrangeas, flirty alstroemerias, freesias, clematis, and even more of those amazingly fragrant peach garden roses. The outdoor ceremony space at My Moon Restaurant has a whimsical garden vibe. For the aisle arrangements, we tied fresh bunches of dark greenery and herbs to the chairs with elegant draping ribbon. Petite hanging vases of wildflowers (shown above) and greenery framed the ceremony space. Einat and Jesse’s wedding was abundant with joy, love, and vibrant flowers in an idyllic setting--even the sweltering NYC summer heat cooled down for perfect ceremony ambiance. Congrats and love again to the beautiful couple.